Congratulations to Tamar Shaw, Community Manager of Victory Heights, on her Accredited Residential Manager designation from the Institute of Real Estate Management! In 2011, transitioning from Hotel Management to Property Management was an important life decision. You could say a “new calling.” It’s my purpose and a passion to be a leader and server in the affordable housing industry. I started working for Habitat America in 2012. Always striving to learn and enhance my skills, I began the trajectory in April of 2017 to become an (ARM) Accredited Residential Manager. My class was four days long in Gaithersburg, MD. The classes consisted of Talent Development, Finance, Marketing and Fair Housing, culminating with a three hour exam on Saturday. I was also required to complete an Ethics course and on-line exam during the summer. The next step was to complete the application and secure three references attesting to my work ethic and character. 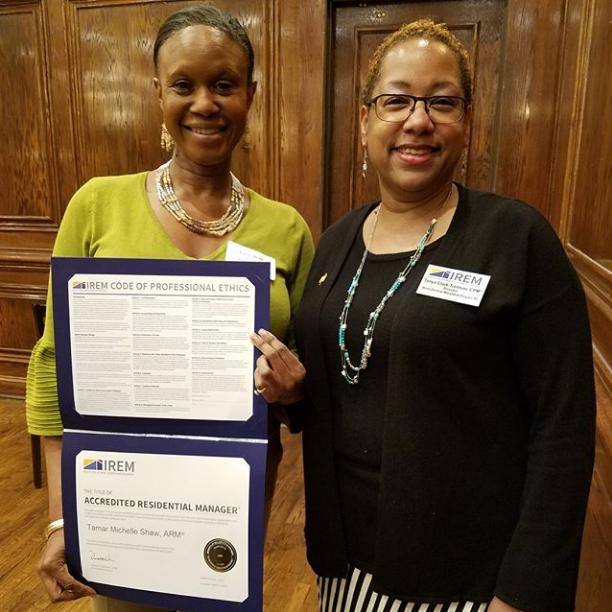 I submitted the application packet in January of 2018 and was accepted and received my certificate during an IREM chapter 8 ceremony in April, which my Regional Manager also attended. It was a challenge commuting to Gaithersburg for a week, but I enjoyed it and gained a wealth of knowledge. Thank you to my very first Habitat Regional Manager Eleanor Puleo and also Tonya Trotman, Dominic Maza and Jeanne Hendricks for their support. For more information on becoming an Accredited Residential Manager please visit http://www.irem.org/.